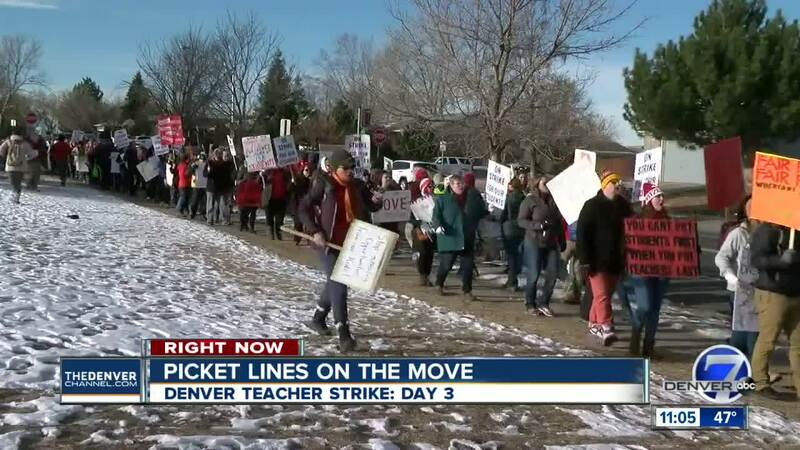 DENVER — After months of negotiations, three days of striking and an all-night discussion, the Denver teacher strike has ended and teachers will return to the classroom Thursday. 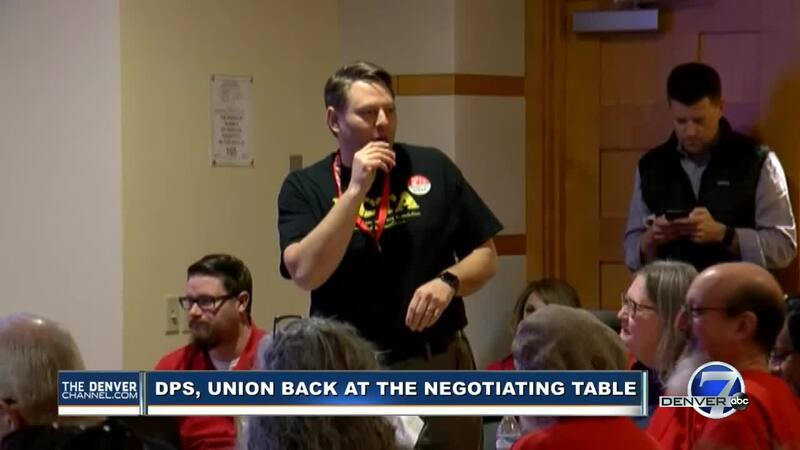 Denver Public Schools (DPS) and the Denver Classroom Teachers Association (DCTA) reached an agreement early Thursday morning during negotiation talks at the Denver Public Library. The strike was sparked after 15 months of failed negotiations over the DPS salary schedule, education and base pay. The tentative agreement reformed a pay system that relied mostly on unstable bonuses. It will also provide stability for students whose educators were driven away by the previous compensation schedule. The tentative agreement must be ratified by the full DCTA membership, DCTA said early Thursday. DPS said those who do not return to work will not be paid. In addition, both sides agreed to a study of the effects of high-priority school bonuses on teacher retention. More details from this agreement will be posted on the DCTA website later Thursday. Denver7 is working to learn more. Stay with us for updates. “I’m hopeful that what we’ve seen here over the past several days really is an example of how we can get work done when we work together,” DPS Superintendent Susana Cordova said early Thursday. She said DPS and DCTA will work collectively and collaboratively in the future. Rob Gould, lead negotiator for the DCTA, said Thursday was a historic day. He said these discussions inspired a whole city to come together for one cause: Denver students. Gov. Jared Polis issued a statement after the agreement was announced. “I am pleased that after months of negotiations, both sides stepped up, worked together, and found a solution that works for our district, our educators, our parents, and most importantly our children," he said. 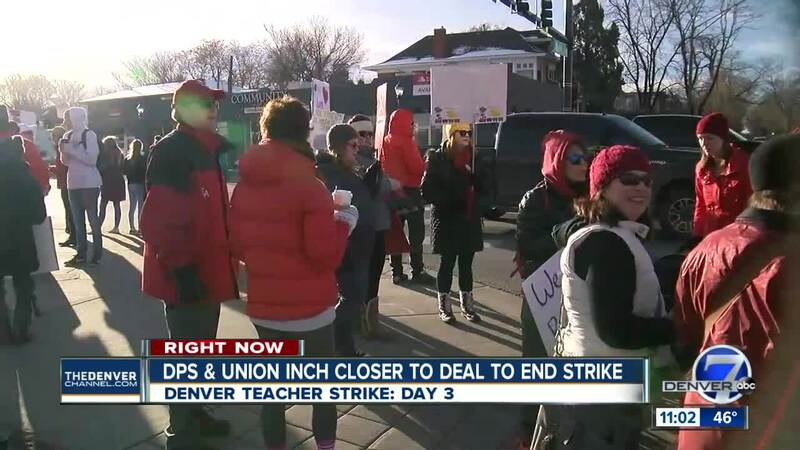 "While it's unfortunate that this agreement was not reached prior to the strike, today’s results are a testament to Denver Public Schools and the Denver Classroom Teachers Association’s commitment to working together in the best interest of our children." DCTA officially decided on Saturday to move on with the strike, after a day of failed negotiations . This came in the wake of Polis declining to intervene on Feb. 6, despite DPS’s request. Throughout the week, DPS remained optimistic, but union officials didn’t believe a resolution was near at that point. After full-day negotiation talks on Friday and Saturday — both of which failed — the union announced it would strike on Monday and not attend the district’s invitation to continue bargaining on Sunday. They would return to the negotiating table on Tuesday, they said. While schools remained opened on Monday, the environment inside was abnormal in the absence of many teachers. Videos from inside local high schools showed students leaving their classrooms and dancing to music in the hallway. Other videos showed groups of students milling around the school on their phones. Cordova said she saw “a real range of things” when she toured a few schools Monday. Some were calm and quiet and others were almost completely empty, where students had walked out in support of their teachers. By 4 p.m., hundreds of teachers were rallying at the state capitol. The total number of participating teachers ranged: DPS said 2,631 teachers were at the strike, but DCTA claims 3,769 teachers and special service providers were picketing. The strike continued Tuesday. Teachers picketed outside schools in the morning before DCTA returned to the negotiation table with DPS around 10 a.m. at the Denver Public Library to once again try to make a deal. Meanwhile, teachers who weren’t at the discussion rallied at Civic Center Park and then marched around downtown Denver. By 3 p.m., DCTA had returned to the table with a counter-proposal to DPS’s proposal from Monday. The district took time to look it over and returned with another proposal. Discussions, both public and private, continued until about 11 p.m., at which point DPS said it needed more time to review the union’s proposal. Both side agreed to return for further talks on Wednesday morning. DPS and the teachers’ union appeared confident that they’d reach an agreement after the meeting Tuesday. In a joint statement released shortly after midnight Wednesday, Cordova and DCTA President Henry Roman wrote that they worked in good faith Tuesday to find common ground. Shortly after the Wednesday morning meeting began, DPS presented a proposal that DCTA expressed interest in. They took a lengthy break to go through the latest proposal, but came back saying they accepted most of it, save a few details. By the afternoon, the mood in the room continued to improve as both sides started to see an end in sight. Shortly before 8 p.m. Wednesday, both groups walked out of the room to have private discussions on a salary schedules. Talks continued well past midnight and into the morning hours Thursday. A few minutes after 6. a.m., DPS returned to the table after reviewing final small details. Cordova said they had one change: a signature line at the bottom. In other words, the strike was over. Roman and Cordova signed the tentative agreement and hugged afterward.